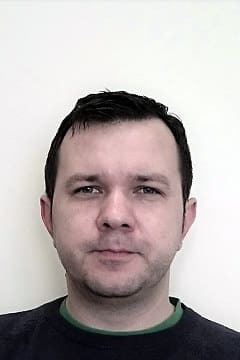 Vytautas Kašėta, Ph.D., is a biologist focused on cellular technologies. He has graduated molecular biology bachelor studies in 2004 in the Vilnius University, microbiology and biotechnology master in 2006 and in 2011 defended his Biomedical sciences Ph.D. thesis on Stem Cell Biology in Immunology, Serology, Transplantation section. Stem cell biology, Immunology, Immune and cellular therapy, mitochondria biology, regenerative medicine, cell and tissue engineering, biological therapy for cancer and autoimmune disorders, nanotechnology in medicine. Stem cell isolation, identification and handling, mammalian cell culture, laboratory animal models, In vivo visualization, flow cytometry and cell sorting, methods in immunology and molecular biology, fluorescent and confocal microscopy. Caspase dependent apoptosis induced in yeast cells by nanosecond pulsed electric fields. Simonis P, Kersulis S, Stankevich V, Kaseta V, Lastauskiene E, Stirke A. Bioelectrochemistry. 2017 Jun;115:19-25. doi: 10.1016/j.bioelechem.2017.01.005. Epub 2017 Feb 6. Quantitative evaluation of the transplanted lin(-) hematopoietic cell migration kinetics. Kašėta V, Vaitkuvienė A, Liubavičiūtė A, Maciulevičienė R, Stirkė A, Biziulevičienė G. Transpl Immunol. 2016 Feb;34:54-9. doi: 10.1016/j.trim.2015.11.003. Epub 2015 Nov 18. Exosomes from Human Dental Pulp Stem Cells Suppress Carrageenan-Induced Acute Inflammation in Mice. Pivoraitė U, Jarmalavičiūtė A, Tunaitis V, Ramanauskaitė G, Vaitkuvienė A, Kašėta V, Biziulevičienė G, Venalis A, Pivoriūnas A. Inflammation. 2015 Oct;38(5):1933-41. doi: 10.1007/s10753-015-0173-6. Impact of diamond nanoparticles on neural cells. Vaitkuviene A, Ratautaite V, Ramanaviciene A, Sanen K, Paesen R, Ameloot M, Petrakova V, McDonald M, Vahidpour F, Kaseta V, Ramanauskaite G, Biziuleviciene G, Nesladek M, Ramanavicius A. Mol Cell Probes. 2015 Feb;29(1):25-30. doi: 10.1016/j.mcp.2014.10.005. Epub 2014 Oct 30. Impact of differently modified nanocrystalline diamond on the growth of neuroblastoma cells. Vaitkuviene A, McDonald M, Vahidpour F, Noben JP, Sanen K, Ameloot M, Ratautaite V, Kaseta V, Biziuleviciene G, Ramanaviciene A, Nesladek M, Ramanavicius A. N Biotechnol. 2015 Jan 25;32(1):7-12. doi: 10.1016/j.nbt.2014.06.008. Epub 2014 Jul 15. Evaluation of cytotoxicity of polypyrrole nanoparticles synthesized by oxidative polymerization. Vaitkuviene A, Kaseta V, Voronovic J, Ramanauskaite G, Biziuleviciene G, Ramanaviciene A, Ramanavicius A. J Hazard Mater. 2013 Apr 15;250-251:167-74. doi: 10.1016/j.jhazmat.2013.01.038. Epub 2013 Feb 8. Skin regeneration with bone marrow-derived cell populations. Ramanauskaitė G, Kašėta V, Vaitkuvienė A, Biziulevičienė G. Int Immunopharmacol. 2010 Dec;10(12):1548-51. doi: 10.1016/j.intimp.2010.09.003. Epub 2010 Sep 22.